기영회란 기로회라고도 하며, 만 70세 이상의 2품 이상 원로 사대부로 구성된 모임을 말한다. 이 기영회의 모임 후에 이를 기념하기 위해 그린 그림이 기영회도이다. 친목 모임인 기영회는 처음에는 주로 산이나 강가에서 열었으나 16세기 이후에는 건물 안으로 장소를 옮겼다. 이 그림은 조선 중기 국가의 원로들이 참석한 기영회 모임을 기념하여 그린 그림이다. 그림의 맨 윗부분에는 기영회도라고 제목을 적고, 가운데에는 건물 대청에서 열리는 연회장면을 그렸으며, 맨 아래부분에는 모임에 참석한 사람들의 이름, 자, 호, 본관, 품계와 관직 등을 앉은 순서대로 차례로 적고 시문과 같은 글도 적어 놓았다. 이에 의하면 이 모임에 참석한 이는 홍성, 노수신, 정유길, 원혼, 정종영, 박대립, 임열 등 7명이다. 건물 대청 안에 있는 모임 참석자들의 모습을 자세하게 그리고 있을 뿐만 아니라 악대나 시녀, 시종들과 같이 부수적인 인물의 다양한 동작과 자세가 사실적으로 묘사되어 당시의 풍속과 기물, 복식 등에 대한 내용을 풍부히 전해주고 있다. 기영회의 공식적이고 주된 행사도 자세하게 그리고 있을 뿐만 아니라 모임의 연회와는 관련이 없는 주위 하인들의 자유스러운 행동도 자세하게 표현하고 있어서 기영회도에 보이는 풍속적 요소를 볼 수 있다. 이 작품은 현재까지 알려진 기영회도 중에서 크기가 가장 클 뿐 아니라 채색의 사용이나 필치의 구사가 뛰어나 16세기 최고 수준의 화원이 그린 것으로 생각되며, 미술사적 가치가 높은 작품이다. 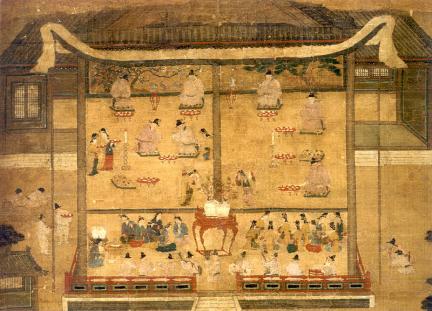 This is a painting of a scene at a meeting of Grade 2 officials or higher aged 70 or older held in the mid-Joseon Period (1392-1910). These meetings, designed to foster friendship, were first held in mountains or on the riverside but came to be held in a building by the 16th Century and thereafter. The title of the painting is stated at the top. 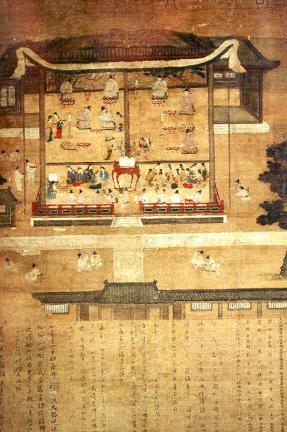 A scene of a party held in a wide wooden hall is portrayed at the center. At the bottom is a statement on the names, pen-names, clan, rank, etc., of the people attending the session in the order they are seated (i.e., Hong Seong, No Su-sin, Jeong Yu-gil, Won Hon, Jeong Jong-yeong, Bak Dae-rip, and Im Yeol) along with poems and prose. The piece not only depicts the appearance of the participants in detail but also makes a realistic description of the movement and posture taken by attendants such as members of the band, waiting maids, and lords-in-waiting. Thus, it provides information on the custom, articles used, and attire of that period in detail. Detailed portrayals of acts done by servants on errands provide a glimpse of the scenes of people’s daily lives. 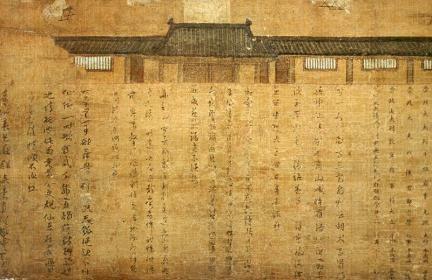 This is the largest known piece of Giyeonghoedo. The skill of using colors and brush strokes suggest that it was painted by a top-notch government artist in the 16th Century.